M/V New Boston is a group entertainment vessel operated by Mass Bay Lines in Boston Harbor in Boston, MA. This picture was sent in by MM. He writes: "Location: A boat called the New Boston, which sails out of Boston Harbor as part of the "Rock On! Concert Cruise" series. "At first I wasn't sure if this really was the men's restroom on the ship. 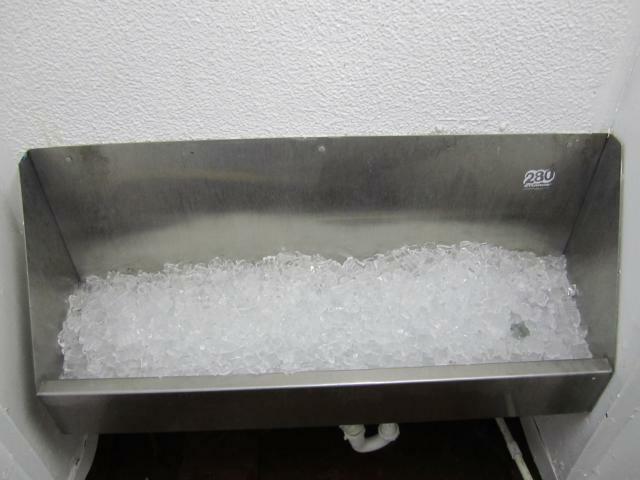 Surely someone put this ice in a trough in order to chill beers or sodas in it, so I was hesitant to use it as a urinal. But after looking around I realized that this was the only gig onboard. I am not sure what the purpose of the ice was; later in the night (this was a raucous Deer Tick show, the band and its fans love to drink) the ice had all but melted away and had been replaced by a good number of beer cans and other various pieces of debris. Glad I was able to snap a picture while the ice was entirely intact. Ever since I've discovered urinal.net, nothing beats kicking off a night with a shot of a great and unusual submission!"